Everybody has their own views of what makes for a successful poker player, whether it be nerves of steel or a natural ability to read your opponent’s behavior. But with online poker, we have actual data that allows us to draw harder conclusions about what makes a player more likely to win. For example, we can begin to answer questions like, are women or men more successful? Does nationality play a factor in your chances? What about beginners’ luck? Taking insights from our own data, here are the main demographic factors that might play a part in whether you become a successful player, or not. Overall, nothing beats experience at poker – those who play often get higher winnings than those who play intermittently, suggesting that players improve over time. However, there is also some “self-selection” at play here, i.e. the players who do end up playing often have a natural intuition for the game, which then makes it worthwhile for them to keep playing and honing their skills. At first glance, it might appear that there is such a thing as beginner’s luck. However, the improved performance of the extreme beginners is more likely due to the fact that new users are often those switching betting providers to find the best option. So, while they appear to be beginners on our system, a fair proportion of this particular group is actually more experienced than the data would suggest. The groups for players staying longer on the system are more representative, as they are by nature excluding users switching between providers for the best new-entrant offer. Men, in general, tend to perform better than women, and the gender gap increases with experience. This is surprising, as women have been proved to be better at multi-tasking, and most experienced poker players usually play on several tables at the same time. The reason for the gender gap is in the way men and women approach the game, especially once age is taken into account. 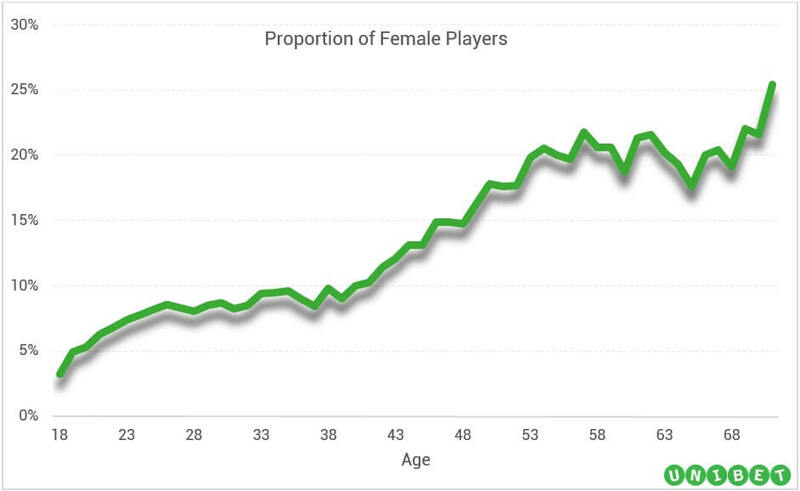 Overall, only 10% of all Unibet’s players are female, but there is a definite trend for female players to take up the game later in life. Older women are more likely to see poker-playing as a fun hobby, compared to the predominantly young male audience who see it as a way to earn fast cash. 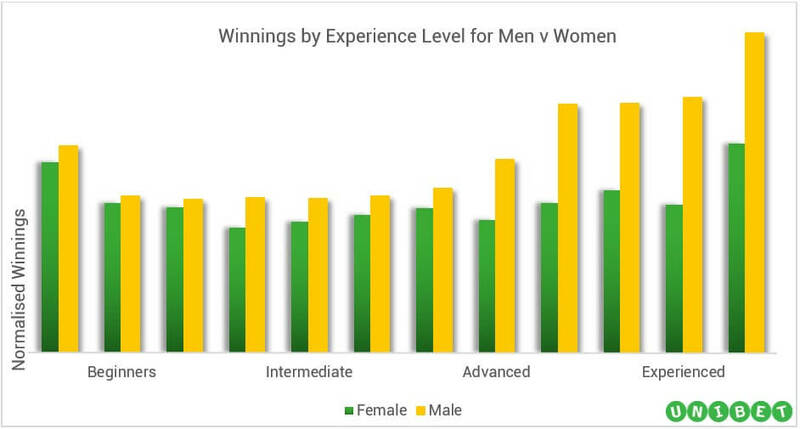 The easiest way to understand the gender gap in winnings is that experienced men tend to be serious about poker becoming their main source of income, and so are keen to invest in learning and training. Older women, on the other hand, are those who simply enjoy the game for the sake of it. Swedes and Danes generally take home the money when playing online poker – reflecting what we see in tournaments, where Scandinavian countries dominate the rankings in Europe. British and Belgian players, on the other hand, appear to be weakest at the game. 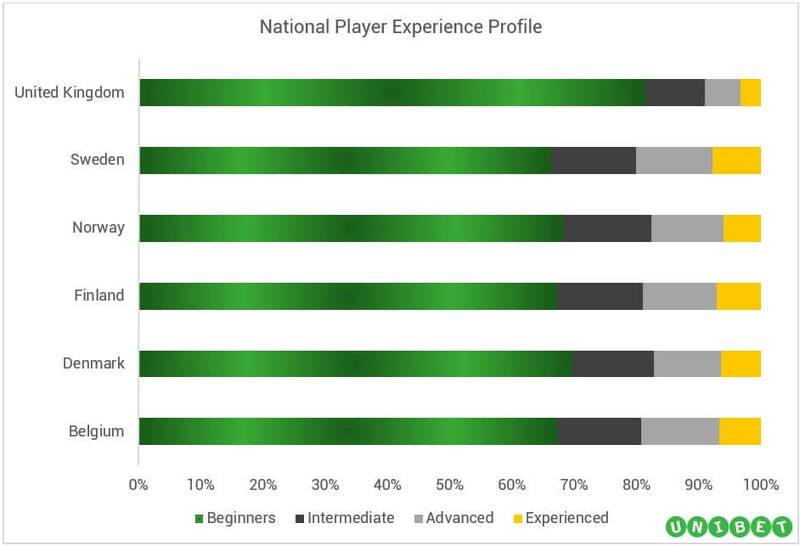 The UK in particular has a higher proportion of inexperienced players than other countries, but very few “hard-core” players. Interest in poker peaks at age 25, and the 20-30 age bracket is by far the most important demographic, as online poker playing appeals to this tech-savvy group. However, players aged 30+ are the ones that tend to win more consistently at poker, highlighting once more the key role that experience plays when you want to win consistently. It probably goes against nature, but young 20-somethings should learn to recognize reckless betting quick – statistics tell us they might get bit pretty quick! 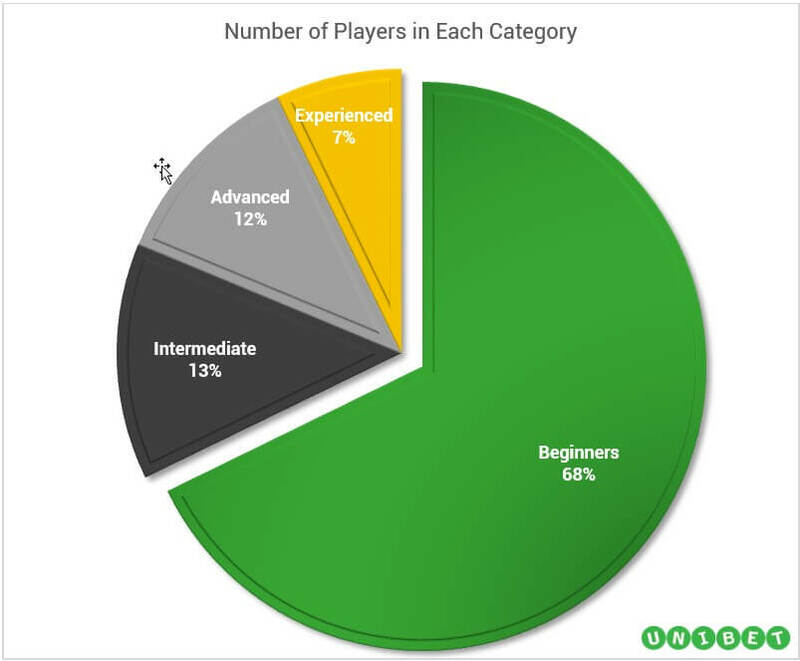 We analyzed the winnings for a random sample of over 300,000 players who used Unibet’s poker platform over the past five years, to figure out what are the identifiable factors in making a poker champion. 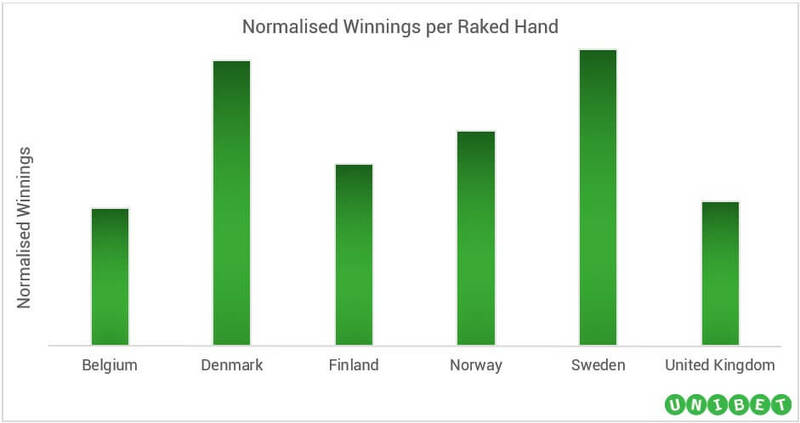 All results were normalised so that 100 is the average won per raked hand across our entire study sample. We only looked at winning figures, so all figures report gains. Figures over 100 report higher-than-average poker winnings, figures below 100 report lower-than-average winnings. For levels of experience, winners were divided into 12 categories, depending on the number of raked hands that we registered for them. In order to simplify the data representation, these were clustered into 4 main experience groups.